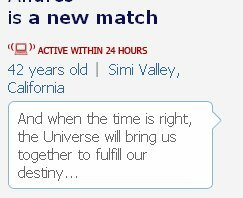 The headline of one of my chemistry match’s today had a headline that made me wonder if perhaps he thought we were both superheros. “I’m the male version of what I’m looking for in a woman, very spiritual, out of the box thinker, awake and aware. I’m a connoisseur in the alien and extraterrestrial phenomena and I’m very interested in benevolent ET’s. I’m honest, compassionate, loyal, high moral and ethical values, fit and slender (always), vegetarian, practice reconnective healing and meditation, love my folks, they’re still married, therefore I’m not psychologically traumatized by divorced parents, it’s hard to find someone like that nowadays. I’m loving and kind, not jealous, financially independent, love cats (have two), very sexual, don’t look my age, speak my mind with integrity, respectful tours nature and others. Plus I am a drummer, goofy at times and in love with life, I’m a hopeless romantic and I AM LOVE! So yes, I look for all of that in a woman more or less. To recap he is a alien loving vegetarian who meditates on loving cats and will only fall in love with a Victoria Secret model whose soul is willing to interact with him. That is strike one, two and three all in one sentence! Nah. No way right? No one can be that big of a tool (he does have a picture of himself in Ohm position on a mountain …). I’m going with the idea that he is joking (I don’t think he is joking) and passing him on. This will end badly. Dude he HAS to be joking. I think he is joking. Yes joking. Joking yes.